First the bad news. According to the University of Oxford’s OurWorldInData.org, 5.6 million children die each year from a variety of causes. That’s 11 deaths a minute, or 15,500 deaths per year. Another fact: the global fertility rate today is 2.5 children per woman. That means the world’s population grows by 1% a year, which is almost certainly unsustainable over the long term, given our planet’s limited resources. 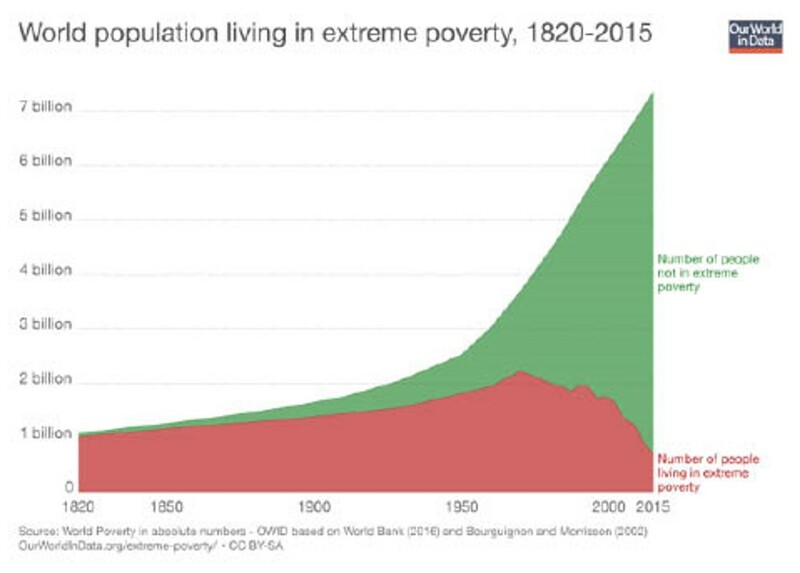 The third fact: One-tenth of all the people in the world are living in extreme poverty—on the equivalent of $1.90 a day. With those limited resources, they barely have access to the basic necessities of life, like food and shelter, education and safe drinking water. Shouldn’t we do something about these awful statistics? As it happens, there’s also good news embedded in Gates’ three facts. 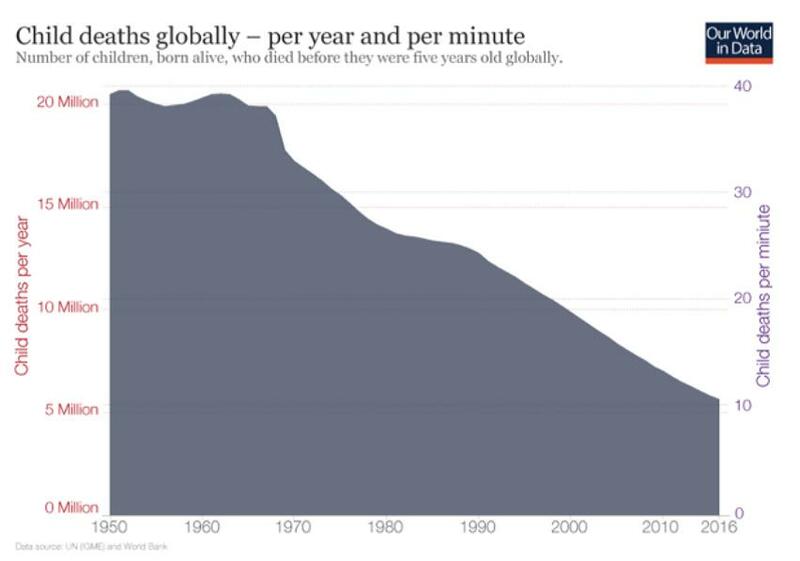 As recently as the 1950s and 1960s, more than 20 million children were dying each year, so the child mortality rate has actually fallen dramatically due to medical advances and increasing global prosperity. We have a long way to go in erasing the pain and tragedy of child mortality, but we have already come a long way and are making continuing progress. The same is true of population growth. 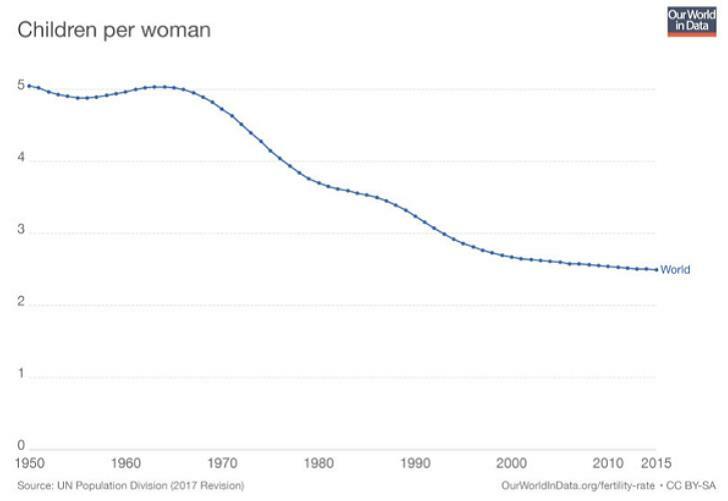 Since 1960, the world’s fertility rate has actually fallen in half, and so has the rate that our world’s population is increasing. If we continue on our present course, the total number of people living on this planet will stabilize and, potentially, start declining in the second half of this century.